Mary Ellen Sprenkel, President and CEO of The Corps Network, issued the following statement in response to the passing of Senator John McCain of Arizona. Senator McCain died Saturday, August 25, 2018 at the age of 81. We are deeply saddened by the passing of Senator John McCain. The country has lost a great leader, patriot, and advocate for what he believed to be in the best interest of our nation. 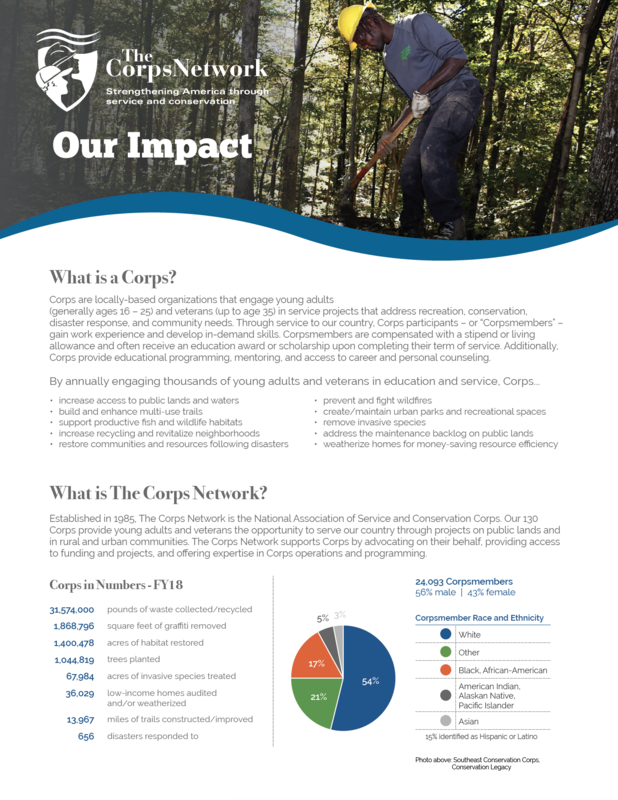 We had the pleasure of working with the Senator on legislation entitled the 21st Century Conservation Service Corps Act, which would help create opportunities for thousands of additional young adults and veterans to serve their country and improve the great outdoors. The Senator was the recipient of The Corps Network 2015 Champion Award, and also the 2016 Franklin D. Roosevelt Service & Conservation Corps Leadership Award. Senator McCain embodied that ethos of service in both his personal and professional lives, and we will remember him for his service to this country as a military veteran of the Navy and public servant in Congress. On behalf of The Corps Network, we send our condolences and best wishes to his family and friends.